Tsongkhapa ("The man from Tsongkha", 1357–1419), usually taken to mean "the Man from Onion Valley", born in Amdo, was a famous teacher of Tibetan Buddhism whose activities led to the formation of the Gelug school of Tibetan Buddhism. He is also known by his ordained name Losang Drakpa (Wylie: blo bzang grags pa) or simply as "Je Rinpoche" (Wylie: rje rin po che). Also, he is known by Chinese as Zongkapa Lobsang Zhaba, He was the son of a Tibetan Longben Tribal leader who also once served as an official of the Yuan Dynasty of China. In his two main treatises, the Lamrim Chenmo (Wylie: lam rim chen mo) and Ngakrim Chenmo (Wylie: sngags rim chen mo), Tsongkhapa meticulously sets forth this graduated way and how one establishes oneself in the paths of sutra and tantra. According to hagiographic accounts, Tsongkhapa's birth was prophesied by the 12th abbot of the Snar thang monastery, and was recognized as such at a young age, taking the lay vows at the age of three before Rolpe Dorje, 4th Karmapa Lama and was named Künga Nyingpo (Wylie: kun dga' snying po). 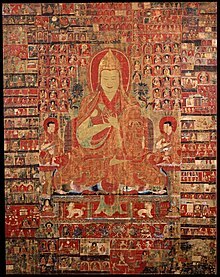 At the age of seven, he was ordained as a śrāmaṇera by Döndrup Rinchen (Wylie: don grub rin chen, 1309–1385), the first abbott of Jakhyung Monastery (Wylie: bya khyung brag), and was given the ordination name Losang Drakpa (Wylie: blo bzang grags pa). Painting depicting the life of Tsongkhapa, the largest image on the left showing the dream he had of the great Indian scholars like Buddhapalita. It was at this early age that he was able to receive the empowerments of Heruka, Hevajra, and Yamantaka, three of the most prominent wrathful deities of Tibetan Buddhism, as well as being able to recite a great many Sutras, not the least of which was Mañjuśrīnāmasamgīti. He would go on to be a great student of the vinaya, the doctrine of behaviour, and even later of the Six Yogas of Naropa, the Kalachakra tantra, and the practice of Mahamudra. At the age of 24, he received full ordination as a monk of the Sakya school. From Zhönnu Lodrö (Wylie: gzhon nu blo gros) and Rendawa (Wylie: red mda' pa), he received the lineage of the Pramanavarttika transmitted by Sakya Pandita. He mastered all the courses of study at Drigung kagyud Monastery in Ü-Tsang. As an emanation of Manjusri, Tsongkhapa is said have been of "one mind" with Atiśa, received the Kadam lineages and studied the major Sarma tantras under Sakya and Kagyu masters. He also studied with a Nyingma teacher, the siddha Lek gyi Dorjé (Wylie: legs gyi rdo rje) and the abbot of Shalu Monastery, Chö kyi Pel (Wylie: zhwa lus pa chos kyi dpal), and his main Dzogchen master was Drupchen Lekyi Dorje (Wylie: grub chen las kyi rdo je), also known as Namkha Gyaltsen (Wylie: nam mkha' rgyal mtshan, 1326–1401). In addition to his studies, he engaged in extensive meditation retreats. He is reputed to have performed millions of prostrations, mandala offerings and other forms of purification practice. Tsongkhapa often had visions of iṣṭadevatās, especially of Manjusri, with whom he would communicate directly to clarify difficult points of the scriptures. Tsongkhapa was one of the foremost authorities of Tibetan Buddhism at the time. He composed a devotional prayer called the Migtsema Prayer to his Sakya master Rendawa, which was offered back to Tsongkhapa, with the note of his master saying that these verses were more applicable to Tsongkhapa than to himself. Tsongkhapa was acquainted with all Tibetan Buddhist traditions of his time, and received lineages transmitted in the major schools. His main source of inspiration was the Kadam school, the legacy of Atiśa. Tsongkhapa received two of the three main Kadampa lineages (the Lam-Rim lineage, and the oral guideline lineage) from the Nyingma Lama, Lhodrag Namka-gyeltsen; and the third main Kadampa lineage (the lineage of textual transmission) from the Kagyu teacher Lama Umapa. Tsongkhapa's teachings drew upon these Kadampa teachings of Atiśa, emphasizing the study of Vinaya, the Tripiṭaka, and the Shastras. Atiśa's Lamrim inspired Tsongkhapa's Lamrim Chenmo, which became a main text among his followers. He also practised and taught extensively the Vajrayana, and especially how to bring the Sutra and Tantra teachings together, wrote works that summarized the root teachings of the Buddhist philosophical schools, as well as commentaries on the Prātimokṣa, Prajnaparamita, Candrakirti's Madhyamakavatara, logic, Pure Land and  the Sarma tantras. Tsongkhapa's distinction he draws between that which is not found and that which is negated. Tsongkhapa's first principal work, The Golden Garland of Eloquence (Wylie: legs bshad gser phreng) demonstrated a philosophical view in line with the Yogacara school and, as became one of his hallmarks, was more influenced by Indian authors than contemporary Tibetan sources. At this time his account of the Madhyamaka "propounds a philosophy that later Gelukpas [...] call Yogācāra-svātantrika-madhyamaka, [...] yet does not have the authority of Candrakīrti's Prāsaṅgika interpretation." For Tsongkhapa, calming meditation alone is not sufficient, but should be paired to rigorous, exact thinking "to push the mind and precipitate a breakthrough in cognitive fluency and insight." The opponents of Candrakirti's Prasanna-padā[note 2] are both (a) the essentialists, who accept that things ultimately have intrinsic nature, and (b) the Svātantrikas, who refute that, but accept that things conventionally have intrinsic character or intrinsic nature. Svatantrikas (like Bhavaviveka) are those Madhyamikas who accept that, at a conventional level, things actually do have intrinsic nature just as they are perceived. To exist at all entails having intrinsic existence. However, since there is nothing that holds up under ultimate analysis, everything is ultimately empty. Emptiness is the lack of ultimate existence. Although Tsongkhapa is regarded as the great champion of the Prasangika-view, according to Thomas Doctor, Tsongkhapa's views on the difference between Prasanghika and Svatantrika are preceded by a 12th-century author, Mabja Jangchub Tsondru (d. 1185). While objecting to Bhavaviveka's understanding of a shared object at the conventional level, Tsongkhapa has to leave intact conventional reality and causality, to keep intact the teachings on cyclic existence and the basis for moral behavior. Therefore, he has to explain how conventional reality is perceived in a valid way, which he does by introducing "conventional valid cognition." Reason that accurately analyzes reality — that is, analyzes whether something intrinsically exists — does not contradict it. Nevertheless, Prāsaṅgika are not stating that nothing exists, but instead, hold that phenomena only come into existence co-dependently with minds which are applying conceptual and nominal conventions to uncharacterized mere experiences. Things and phenomena do exist co-dependently, based upon a relationship with a knowing and designating mind, but nothing exists - including the fundamental characteristics which compose our experience - in an independent, self-arising, or self-sustaining manner. For Tsongkhapa, extended rational analysis is required to correctly establish what it is that is to be negated. [note 12] This correct establishment is necessary to reach a liberating insight into emptiness, while avoiding the trap of nihilism, the possibility that "seeming reality becomes extinct or invalidated if a phenomenon is empty of that very phenomenon." Gyumed Khensur Rinpoche Lobsang Jampa, referring to Kalden Gyatso, notes that "there are actually two objects that must be refuted or destroyed," namely this sense of "I," and the subjective self, "the mind grasping at that false 'I'." By analyzing the sense of "I" and it's logical contradictions, it's seemingly true existence is seen through, which "destroys the continuum of the subjective mind grasping it. What continues is a wisdom mind." Tsongkhapa describes a procedure for establishing the non-existence of a substantial, abiding essence in either the self or in 'exterior' phenomena, such as pots or potatoes. It is essential during this procedure that one does not confuse the non-findability of a substantial, non-relational self with the refutation of the existence of a relative or conventional self – the self as it appears to ordinary cognition and which is subject to the law of cause and effect. More marvellous than this discovery? Since objects do not exist through their own nature, they are established as existing through the force of convention. There is no way to overcome the misconceptions of those who think that emptiness is a real thing. For example, if you tell someone, 'I have nothing.' and that person says, 'Give me that nothing.' How could you make that person understand that you have nothing? Ultimate truth does not point to a transcendent reality, but to the transcendence of deception. It is critical to emphasize that the ultimate truth of emptiness is a negational truth. In looking for inherently existent phenomena it is revealed that it cannot be found. This absence is not findable because it is not an entity, just as a room without an elephant in it does not contain an elephantless substance. Even conventionally, elephantlessness does not exist. Ultimate truth or emptiness does not point to an essence or nature, however subtle, that everything is made of. According to Tsongkhapa, for the Prāsaṅgika the philosophical position of emptiness is itself a non-affirming negation, since emptiness is a "lack of inherent existence." One is not affirming anything in the place of that absence of inherence. It is not the presence of some other quality. If one were to describe emptiness as the presence of some quality -for example, a "voidness" or a "thusness" - it would linguistically and philosophically contradict the nature of the object which it is attempting to characterize. The dawning realization of emptiness can be frightening, arousing "fear of annihilation." Some Mahayana sutras therefore argue that the so-called storehouse consciousness or mind-basis-of-all consciousness was taught by the Buddha "provisionally, for the benefit of those who could be helped by believing in its existence but who would be harmed by hearing the teachings about emptiness." Statue of Tsongkhapa, founder of the Gelugpa school, on the altar in his temple (his birthplace) in Kumbum Monastery, near Xining, Amdo, Tibet. Though the Sakya had their own teachings on these subjects, Tsongkhapa was coming to realize that he wanted to create something new, not necessarily a school, but at least a new formulation of the Buddhist Path. Tsongkhapa emphasised a strong monastic Sangha. With the founding of the Ganden monastery in 1409, he laid down the basis for what was later named the Gelug ("virtuous ones") order. At the time of the foundation of the Ganden monastery, his followers became to be known as "Gandenbas." Tsongkhapa himself never announced the establishment of a new monastic order. After Tsongkhapa had founded Ganden Monastery in 1409, it became his main seat. He had many students, among whom Gyaltsab Je (1364–1431), Khedrup Gelek Pelzang, 1st Panchen Lama (1385–1438), Togden Jampal Gyatso, Jamyang Choje, Jamchenpa Sherap Senge, and the 1st Dalai Lama (1391–1474), were the most outstanding. After Tsongkhapa's passing his teachings were held and kept by Gyaltsab Dharma Rinchen and Khedrub Gelek Pälsang. From then on, his lineage has been held by the Ganden Tripas, the throne-holders of Ganden Monastery, among whom the present one is Thubten Nyima Lungtok Tenzin Norbu, the 102nd Ganden Tripa. After the founding of Ganden Monastery by Tsongkhapa, Drepung Monastery was founded by Jamyang Choje, Sera Monastery was founded by Chöje Shakya Yeshe and the 1st Dalai Lama founded Tashilhunpo Monastery. Many Gelug monasteries were built throughout Tibet but also in China and Mongolia. He spent some time as a hermit in Pabonka Hermitage, which was built during Songsten Gampo times, approximately 8 kilometres north west of Lhasa. Today, it is also part of Sera. Among the many lineage holders of the Gelugpas there are the successive incarnations of the Panchen Lama as well as the Chagkya Dorje Chang, Ngachen Könchok Gyaltsen, Kyishö Tulku Tenzin Thrinly, Jamyang Shepa, Phurchok Jampa Rinpoche, Jamyang Dewe Dorje, Takphu Rinpoche, Khachen Yeshe Gyaltsen, Trijang Rinpoche, Domo Geshe Rinpoche, and many others. The annual Tibetan prayer festival Monlam Prayer Festival was established by Tsongkhapa. There he offered service to ten thousand monks. The establishment of the Great Prayer Festival is seen as one of his Four Great Deeds. It celebrates the miraculous deeds of Gautama Buddha. First, with a few exceptions, the majority of books or articles on Madhyamaka by Western - particularly North American - scholars is based on the explanations of the Gelugpa school of Tibetan Buddhism. Deliberately or not, many of these Western presentations give the impression that the Gelugpa system is more or less equivalent to Tibetan Buddhism as such and that this school's way of presenting Madhyamaka is the standard or even the only way to explain this system, which has led to the still widely prevailing assumption that this is actually the case. From the perspective of Indian and Tibetan Buddhism in general, nothing could be more wrong. In fact, the peculiar Gelugpa version of Madhaymaka is a minority position in Indo-Tibetan Buddhism, since its uncommon features are neither found in any Indian text nor accepted by any of the other Tibetan schools. As Khedrup and later followers of Tsongkhapa hit back at accusations like these, they defined their own philosophical tradition, and this went a long way to drawing a line in the sand between the Gandenpas and the broader Sakya tradition. Tsongkhapa promoted the study of logic, encouraged formal debates as part of Dharma studies, and instructed disciples in the Guhyasamāja, Kalacakra, and Hevajra Tantras. Tsongkhapa's writings comprise eighteen volumes, with the largest amount being on Guhyasamāja tantra. These 18 volumes contain hundreds of titles relating to all aspects of Buddhist teachings and clarify some of the most difficult topics of Sutrayana and Vajrayana teachings. Tsongkhapa's main treatises and commentaries on Madhyamaka are based on the tradition descended from Nagarjuna as elucidated by Buddhapālita and Candrakīrti. The Praise of Relativity (rten 'brel bstod pa). Bronze depicting Tsongkhapa, who is known and revered by Mongolians as Bogd Zonkhova. Dependent-Arising and Emptiness: A Tibetan Buddhist Interpretation of Mādhyamika Philosophy, trans. Elizabeth Napper, Wisdom Publications, ISBN 0-86171-364-8: this volume "considers the special insight section of" the Lam Rim (p. 8). ^ According to Thupten Jinpa, Tsongkhapa's interpretation of the Madhyamaka's key tenets is to be regarded as an important lineage within the Buddhist religious and philosophical milieu, sharing the basic soteriological concerns of the Buddhist path. ^ For example, if cause-effect relationships occur because the sprout itself produces the effect of being a sprout (self-arising), then this "would mean that something that already exists is being produced, [and] production would be purposeless and endless [... if] contradictions are assembled in this way, the only result is that the opponents understand them and abandon" wrong tenets. To clarify with a more modern rendition: if 500 people were shown 100,000 slides of a seed turning into a small plant, would we expect them all to agree that on slide number 1,008 the seed causes the sprout? If one argues that the seed objectively and independently causes the sprout (other-arising) or that the sprout causes itself (self-arising) at the material level, then everyone would be forced to agree that this event occurs at a particular time. However, because the sprout arises relative to a conscious observer who designates the term-concept "sprout" onto the continuum of slides, we find that almost no one can agree where the seed ceases and the sprout arises. This is because the cause-effect relationship cannot be found at the objective material level. The cause-effect relationship is also dependently designated, a viewpoint which is established by Lama Tsongkhapa, Nagarjuna, and Buddapalita. ^ "Thus, [Chandrakirti] says that those are synonyms. 'Without depending on another' does not mean not depending on causes and conditions. Instead, 'other' refers to a subject, i.e., a conventional consciousness, and something is said not to depend on another due to not being posited through the force of that conventional consciousness." ^ A parallel in western thought can be found in the viewpoint of intentionality: "
Every mental phenomenon is characterized by what the Scholastics of the Middle Ages called the intentional (or mental) inexistence of an object, and what we might call, though not wholly unambiguously, reference to a content, direction towards an object (which is not to be understood here as meaning a thing), or immanent objectivity. Every mental phenomenon includes something as object within itself, although they do not all do so in the same way. In presentation something is presented, in judgment, something is affirmed or denied, in love loved, in hate hated, in desire desired and so on. This intentional in-existence is characteristic exclusively of mental phenomena. No physical phenomenon exhibits anything like it. We could, therefore, define mental phenomena by saying that they are those phenomena which contain an object intentionally within themselves. ^ In Kelsang Gyatso's Lorig translation: "The definition of mind is that which is clarity and cognizes. This definition, 'clarity' refers to the nature of mind, and 'cognizes to the function of mind." ^ It is unclear which specific school of thought Tsongkhapa refers here to. if what does not exist anyway, even without words? Cause understanding; they do not eliminate." HTsongkhapa also quotes Nagarjuna's Commentary on Refutation of Objections: "The words, “All things lack intrinsic nature,” do not cause things to lack intrinsic nature, but, in the absence of intrinsic nature, they do make it understood that things lack intrinsic nature." Tsongkhapa then gives the following paraphrased example. If a person named Devadatta is not in the house, but someone says, “Devadatta is in the house.” Then in order to show that Devadatta is not there, someone else will say, “Devadatta is not there.” Those words do not cause Devadatta not to be there but allow the first person to understand that Devadatta is not in the house. Similarly, the words, “Things lack intrinsic nature,” do not cause things to lack intrinsic nature, but help the those confused by ignorance to gain a valid cognition of reality. * Hopkins: "[I]f you have understood the view of the Middle Way School, you may conceive the I as only being nominally existent." * Tsongkhapa: "“self” refers to mere essential or intrinsic existence and also refers to the object of an awareness that simply thinks, “I.” Of these two, the former is the object negated by reason, whereas the latter is accepted conventionally, so it is not refuted." Lama Tsongkhapa further explains: "Suppose that we leave aside analysis of how [phenomena] appear—i.e., how they appear to a conventional awareness—and analyze the objects themselves, asking, 'What is the manner of being of these phenomena?' We find they are not established in any way. Ignorance does not apprehend phenomena in this way; it apprehends each phenomenon as having a manner of being such that it can be understood in and of itself, without being posited through the force of a conventional consciousness. Tsongkhapa goes on to say: "The absence of this quality in the person is called the selflessness of the person; its absence in phenomena such as eyes, ears, and so forth is called the selflessness of objects. Hence, one may implicitly understand that the conceptions of that intrinsic nature as present in persons and objects are the conceptions of the two selves." ^ The Indo-Tibetan rope & snake analogy explains this further. Under low light, the thought might arise that a striped rope on the ground is a snake, "but there is nothing on top of or inside this rope [...] to which we could" validly apply the term and therefore establish a conventionally existing snake. The Dalai Lama expands: "Like this example, a thought of 'me' may arise on the basis of the aggregate factors of our experience. But there is nothing about these aggregates as the basis for labeling - not any of their parts, nor the collection or network of their parts, nor their continuum over time, nor something separate and apart from them - which is a basis with the defining characteristic making it 'me,' to which we could possibly apply the name 'me.' That being the case, this 'me' is nothing more than simply what can be designated by a mental label on the basis of aggregate factors of experience. In reality, the self of persons, objects, and abstracts is like the term-concept "snake" being designated upon a rope, "the snake is merely what can be designated by a mental label." Like this, the object of negation or ignorance is viewed to be the thought and perception which grasps the self of persons and objects to be established within their respective bases of designation. To put this in somewhat simpler terms, the thought and perception which grasps persons, things, and abstracts phenomena as existing in-and-of themselves - with characteristics or an identity of their own - is seen to be ignorance in this system. ^ Tsonghkhapa: "Based on just this [intrinsic nature], the referent object of the way that ignorance apprehends things as explained above, essentialist schools—Buddhist and non-Buddhist—reify many different things. When you negate the referent of ignorance’s cognitive process, you completely stop all of these tenet-driven reifications, as though you cut a tree at its root. Therefore, those who have the faculty of wisdom should understand that the referent object of innate ignorance is the basic object of negation and should not devote themselves merely to refuting imaginary constructs that are imputed only by the advocates of philosophical tenets. [...] What binds all living beings in cyclic existence is innate ignorance; acquired ignorance exists only among those who advocate philosophical tenets, so it cannot be the root of cyclic existence. It is extremely important to gain specific and certain knowledge of this point." One must realize emptiness in order to become liberated and therefore some "Arhats" who have only realized a coarse selflessness are not actually liberated. There is desire that either is, or is thoroughly mixed with, the conception of true existence, and so-called Arhats still have this sort of desire. Although some of these "Arhats" do indeed have yogic direct perception of the four noble truths, one does not have to be an Arhat or even a Superior (one who has directly realized emptiness) in order to have such yogic direct perception. Although some of these "Arhats" have indeed realized the coarse aspects of the four noble truths, such a realization is not sufficient to overcome the obstructions to liberation. Since true cessations, the irrevocable cessation of some portion of the afflictions of desire, hatred, etc., are also emptinesses, such "Arhats" who have not realized emptiness could not have experienced true cessations, i.e., could not have overcome the afflictive obstructions." ^ Tsongkhapa: "If you do not understand this and fail to eradicate the perspective of innate ignorance, then, when you refute a personal self, you will only refute a self that is permanent, unitary, and independent [...] Even if you actualized such a selflessness in meditation and consummated your cultivation of it, nothing would come of it. It would be extremely absurd to claim that you can overcome innate afflictions by seeing as nonexistent the two selves imputed by acquired misconceptions." ^ Chandrakirti: "When knowing selflessness, some eliminate a permanent self, but we do not consider this to be the basis of the conception of "I." It is therefore astonishing to claim that knowing this selflessness expunges and uproots the view of the self. [This is equivalent to] if someone sees a snake living in the wall of his house. To ease his concern, someone else says, 'there is no elephant there.' Alas, to others it is ridiculous that this would expel the fear of the snake. ^ They exist in a relationship of entity or identity. A relationship of entity or identity is one in which two objects are merely conceptually distinct, but not actually distinct. For example, the relationship between the mental categorization of a dog and that of an animal, with regards to the same being. If it is a dog, then it must also be an animal. Additionally, this relationship applies to impermanent phenomena and products: if it's impermanent, it must be a product. "Form is empty. Emptiness is form. Emptiness is not other than form; form is also not other than emptiness. In the same way, feeling, discrimination, compositional factors, and consciousness are empty. unproduced, unceased; stainless, not without stain; not deficient, not fulfilled." ^ Pabongka Rinpoche states in Liberation in Our Hands that if we can not correctly "recognize the nature of the false mode of existence that is being denied, we will not be able to realize the simple negation [Skr. prasajyapratisedhah or non-affirming negation] that is established through its refutation." ^ "[A non-affirming negation is defined as] a negative object in which no further entity is implied when the mind negates the object that is related to it." ^ Another example can be found in the debate over the use of the terms "devoid of nature itself" in Gelug Mahamudra (non-affirming negation) and "that which has voidness as its nature" in non-Gelug Mahamudra and Dzogchen (an affirming negation). ^ According to the Gelugpa, the Chittamatra hold that the mind-basis-of-all consciousness is that which bears the karmic seeds and is findable upon analysis. That is, "if one sought the basis of the designation of the person one would discover the mind-basis-of-all." The Madhyamika-Prasangika posit that beings accumulate karma and experience their effects without the mind-basis-of-all? They posit that karma is carried on the mere "I" which is dependently designated on the basis of the aggregates, stating that "it is a sufficient basis with which to associate the factors of disintegratedness (karma)." Daniel Cozant expands by saying that since phenomena are neither inherently created nor inherently destroyed according to Prasangika, that "therefore, the possibility of a later effect is not precluded." ^ As Thakchö says, Rongton Shakya Gyaltsen, Taktsang Lotsawa, Gorampa, Shakya Chogden, The eighth Karmapa Mikyo Dorje, Mipham Rinpoche, Gendün Chöphel and others have raised serious and fierce objections against Tsongkhapa's views of Madhyamaka, whereas Gyaltsab Je, Khedrub Je, Gendun Drub, Sera Jetsun Chokyi Gyaltsen, Panchen Sonam Dragpa, Panchen Lobsang Chokyi Gyaltsen, The first Jamyang Zhépa, Changkya Rolpai Dorje, Konchog Jigme Wangpo and others have vehemently defended his interpretation. ^ According to Brunnhölzl, writing from a Karma Kagyü (Mahamudra) point of view on Madhyamaka, "All critics of Tsongkhapa, including the Eighth Karmapa, agree that many features of his Centrism are novelties that are not found in any Indian sources and see this as a major flaw." Yet, Brunnhölzl also notes that "the point here is whether what is said accords with and serves to accomplish the Buddha’s fundamental concern of liberation from cyclic existence and attaining Buddhood." ^ Thupten: "The traditional Geluk understanding of these deviations in Tsongkhapa's thought attributes the development of his distinct reading of Madhyamaka philosophy to a mystical communion he is reported to have had with the bodhisattva Manjusri [...] It is interesting that the tradition Tsongkhapa is claiming to honour is, in a strict sense, not the existing system in Tibet; rather, it appears to be in the tradition of Manjusri as revealed in a mystic vision! ^ Sonam Thakchoe or José Cabezón: "Gorampa, in the Lta ba ngan sel (Eliminating the Erroneous View), accuses Tsongkhapa of being "seized by demons" (bdud kyis zin pa) and in the Lta ba'i shan 'byed (Distinguishing Views) decries him as a "nihilistic Madhyamika" (dbu ma chad lta ba) who is spreading "demonic words" (bdud kyi tshig)." 2) misconceiving emptiness as a real entity"
Emptiness can be misconstrued as a real entity in two ways: "Tsongkhapa and his followers claim that emptiness is an existent and thus the actual nature of entities, which are its supports. Most other Tibetans in this category, such as Dölpopa and Sakya Chogden, say that only emptiness (which is really established) exists, whereas, ultimately, all other phenomena of the seeming level do not exist. Both of these views are mistaken with regard to the path to liberation. ^ The subtle difference between "conventional existence" and "true existence," and the dangers it entails when not understanding it, has also been noted and accepted by later critics of Tsongkhapa, such as Mipham Rinpoche. Padmakara Translation Group: "Mipham Rinpoche attacked it tirelessly as a pernicious distortion that actively hinders the experience of the absence of conceptual construction, which alone is the hallmark of the true realization of emptiness. It is clear, however, that Mipham’s attack was not directed at Tsongkhapa personally, about whom he invariably speaks in respectful terms. His critique, like that of Gendun Chöpel in his Ornament of Nagarjuna’s Meaning, is directed at a possible misrepresentation of Tsongkhapa’s meaning, resulting in what Jeffrey Hopkins refers to as a "pedagogical fault." The assertion that 'the pot is not empty of pot but of true existence' — by someone for whom the distinction between the object of negation and the basis of negation means nothing on the experiential or even intellectual level — far from calling into question the apparent reality of phenomena, tends instead to confirm the deep-rooted habitual belief in substantial reality. In the last analysis, it is a species of realism. It involves a separation of the two truths and is in practice indistinguishable from Bhavaviveka’s Svatantrika assertion that phenomena, though empty ultimately, exist according to their characteristics on the conventional level." ^ "All things arise in dependence on causes and conditions, and this is the meaning of dependent origination". ^ "Although both from the standpoint of reality and from that of everyday life, The sevenfold reasoning shows that a chariot cannot be established, in everyday life, without analysis it is designated in dependence on its parts." ^ "Although dependent origination is generally maintained to be dependence upon conditions, from our perspective, this is not inconsistent with [them existing in] dependence upon mundane nominal conventions." ^ The Gelug text on mind and mental factors. ^ The 14th Dalai Lama: "When the issue of how do ultimately unfindable things actually exist becomes unbearable and we have to say something, the bottom line is that their existence is established by virtue simply of names. In other words, the existence of these things is established and proven by virtue simply of the fact that they can be named within the context of mental labeling. There is no additional need for an inherent, findable, defining characteristic on the side of the basis for labeling rendering things existent and giving them their identity. Thus the existence of ultimately unfindable things is merely conventional." ^ To exemplify this, Lama Tsongkhapa quotes Buddhapalita's response to an Abhidharmica's objection: "It is utterly impossible for time, [causes, effects, and collections of causes and conditions] and such to exist essentially, as you imagine. However, they are established as dependent designation." According to Lama Tsongkhapa, referring to Buddhapalita, this was one of the points of Nagarjuna's Chatuṣkoṭi. Tsongkhapa: "Buddhapalita says, "Nor do things arise from others, because then anything could arise from anything." [Tsongkhapa continues] Here, the reason why the absurd consequence of "if there was arising from another, anything could arise from anything" is presented is that the "other" in "arising from other" is not just something that is different in virtue of being the referent of a different noun, but something that is inherently existent as different. If it existed in that way, then the sprout's depending on the seed would be inconsistent; thus, their relation would be refuted. If [the sprout] were to arise from another unrelated object, then it would arise from anything! ^ Chandrakirti, in the Seven-Point Analysis of a Chariot: "A chariot is neither asserted to be other than its parts, nor to be non-other. It does not possess them. It does not depend on the parts and the parts do not depend on it. It is neither the mere collection of the parts, nor is it their shape. It is like this." ... a chariot is a mere imputation since it does not exist in these seven ways." ^ In The Gelug/Kagyu Tradition of Mahamudra, the Dalai Lama states that if we scrutinize "the abiding, deepest nature of mind itself as mere clarity and awareness,[note 9] we see that its existence is established by virtue simply of the fact that is can be mentally labeled." This mental label "mind" is applied to "a continuity of former and later moments of cognition." ^ From the 1st Panchen Lama's Lozang Chokyi Gyeltsen, one of Tsongkhapa's five main disciples, The Main Road of the Triumphant Ones: "Before the face of proper, total absorption on the actual nature of reality, there is just the severance of fantasized, impossible extremes - namely, inherent, findable existence or total non-existence - with respect to everything of samsara and nirvana. Yet, after you arise, when you inspect, you see that your mind still gives rise to the appearance of things that dependently arise, which do function and can only exist as simply what can be labeled by names. It is unmistakable that such things still naturally dawn, yet they are like dreams, mirages, reflections of the moon in water, and illusions." ^ van Schaik, Sam. "Amdo Notes III: Gold and turquoise temples". early Tibet. Retrieved 11 November 2014. ^ a b c 陈庆英 (2005). 达赖喇嘛转世及历史定制英. 五洲传播出版社. pp. 6–. ISBN 978-7-5085-0745-3. ^ Thurman 2009, p. 243. ^ Berzin, Alexander (December 2003). "The Life of Tsongkhapa". Study Buddhism. Retrieved 2016-06-06. ^ Halkias, Georgios. Luminous Bliss: a Religious History of Pure Land Literature in Tibet. With an Annotated Translation and Critical Analysis of the Orgyen-ling golden short Sukhāvatīvyūha-sūtra. Honolulu: University of Hawai'i Press, 2013, Chapter 4. ^ "legs bshad gser phreng". Tibetan Buddhist Resource Center. TBRC. ^ a b Cabezón 2005, p. 9387. ^ a b c Newland 2008, p. 77. ^ Newland 2008, p. 77–78. ^ Newland 2008, p. 78. ^ Shantarakshita 2005, p. 131–141. ^ a b Tsongkhapa. Lamrim Chenmo. p. 229. ^ Tsong Khapa 2002, p. 274-275. ^ a b Brünholzl 2004, p. 560. ^ "Prasannapadā", 2b. ; trans. Garfield, Candrakīrti. (2003). Sarnath: Gelukpa Student Welfare Committee. ^ "Madhyamakavatara-bhasya", p.259, trans. Garfield, Candrakīrti. (1992). Sarnath: Kagyud Relief and Protection Society. ^ Newland 1999, p. 103-108. ^ Dalai Lama & Gelug/Kagyu Tradition of Mahamudra, p. 148. ^ a b Tsong Khapa 2002, p. 178. ^ Ocean of Reasoning & Tsong Khapa 2006. ^ a b c Lama Tsongkhapa, Ocean of Reasoning, pg. 67. ^ a b Tsongkhapa. Lamrim Chenmo. p. 279. ^ a b Dalai Lama & Berzin 1997, p. 152-153. ^ a b c Dalai Lama & Berzin 1997, p. 101. ^ Tsongkhapa. Lamrim Chenmo. pp. 155–157, deeper reading 155-194. ^ a b Tsong Khapa 2002, p. 205. ^ Tsong Khapa 2002, p. 204-5. ^ Tsongkhapa 2002, p. 205. ^ Brunnholzl 2004, p. 567. ^ a b c Jinpa 2006, p. 374. ^ a b Hopkins 1999, p. 49. ^ a b Tsong Khapa 2002, p. 215. ^ a b Garfield & Thakchöe 2011, p. 77. ^ Tsong Khapa 2002, p. 212. ^ Tsong Khapa 2002, p. 213. ^ a b Tsong Khapa 2002, p. 211. ^ a b Tsong Khapa 2002, p. 197. ^ Tsong Khapa 2002, p. 291-307. ^ It has become a stock procedure of the Gelugpa:See, for example, Jeffrey Hopkins'ontroduction to the Kalachakra Tantra. ^ Newland 2008, pp. 32-33. ^ Tsong Khapa 2002, p. 191. ^ a b Hopkins 1994, p. 245. ^ a b c Brunnhölzl 2004, p. 555. ^ Brunnhölzl 2004, p. 11-12. ^ a b c Brunnhölzl 2004, p. 556. ^ a b Jinpa, Thupten. Self, Reality and Reason in Tibetan Philosophy. Routledge 2002, page 17. ^ a b Thakchoe 2004, p. 125. ^ a b Cabezón & Dargyay 2007, p. 17. ^ Brunnhölzl 2004, p. 558-560. ^ Brunnhölzl 2004, p. 556-557. ^ Brunnholzl 2004, p. 565. ^ Introduction to the Middle Way: Chandrakirti's Madhyamakavatara with Commentary by Ju Mipham, Section "Mipham Rinpoche and the Prasangika-Svatantrika Distinction"
Brunnhölzl, Karl (2004). The Center of the Sunlit Sky: Madhyamaka in the Kagyu Tradition. Snow Lion Publications. ISBN 978-1-55939-955-5. Cabezón, José Ignacio; Dargyay, Geshe (2007). Freedom from Extremes: Gorampa's "Distinguishing the Views" and the Polemics of Emptiness. Wisdom Publications. ISBN 978-0-86171-523-7. Thakchoe, Sonam (2004). The Two Truths Debate: Tsongkhapa and Gorampa on the Middle Way. Wisdom Publications. ISBN 978-0-86171-501-5. Thurman, Robert (2009). Life and Teachings of Tsong Khapa. Library of Tibetan Works & Archives. ISBN 978-81-86470-44-2.